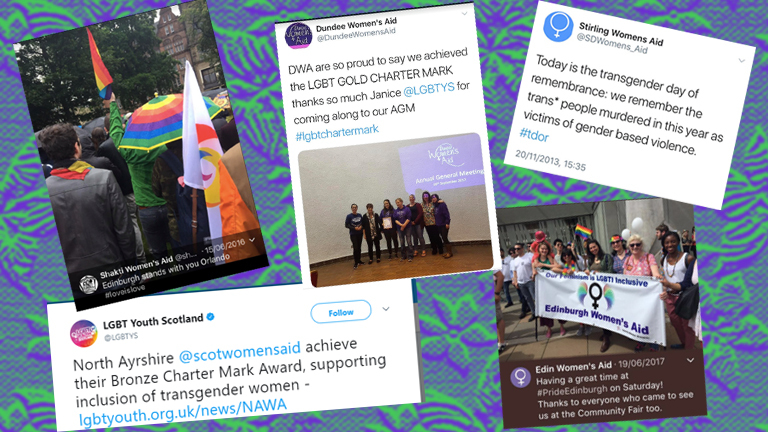 Last week we wrote an article in response to a column in The National written by Shona Craven about the Scottish Government’s consultation on proposed changes to the Gender Recognition Act (closing date March 1st!). Our response mentioned this joint statement by Scotland’s national women’s organisations, and we’ve since had some feedback about it. 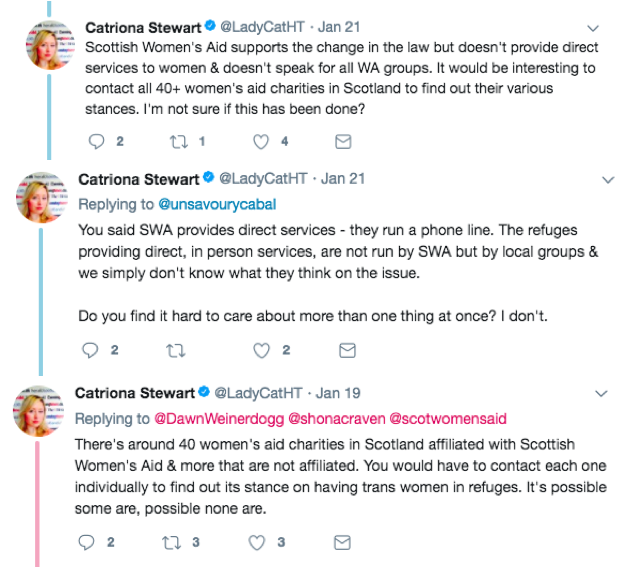 It was stated that Scottish Women’s Aid don’t speak for individual Women’s Aid services, so unless we somehow managed the impossible task of ringing round all 40 to check if they were trans inclusive, we couldn’t possibly know. Spoiler alert: the only reason that’s impossible is because there’s actually 36, but more on that in a bit. I had a midweek day off and my maw got me unlimited minutes for Christmas, so I rang them and asked. Catriona ‘We Simply Don’t Know’ Stewart is a senior journalist at the Herald & Times Group. To me that means she’s got a fancy desk, a big salary and every contact under the Scottish not sun at her fingertips. But rather than try and find out so she didn’t give ground to the misrepresentation of services and instill fear in women who might need to one day present at their local Women’s Aid and might also be trans, she sent a pointed and scary tweet, then logged out. Brass neck points for pulling us up for not speaking to individual services, while choosing to imply something more than a bit dodgy without… speaking to individual services. (Just ring them, Catriona, and if you can’t be arsed surely there’s an underpaid intern somewhere who’s fed up shredding Iain Macwhirter’s draft novellas). We weren’t surprised that frontline workers and specifically support and refuge workers were the people this mibby, mibby not but probably transphobia was being attributed to. No one is else going to say it so I will because none of you know my real name: that’s because those workers are more likely to be working class women. And of course the implication is that while national officers might understand the ever so complicated dance of being sound to trans women, workers on the ground have been caught in a whirlwind of confusion and outright rage, turning up to work head to toe in trans panic alarms for the last 10 year. Gies peace. And let them do their job. If the one day I spent twirling a phone cord in my pajamas taught me anything, it’s that a lot of these services are working hard to dismantle perceived and real barriers that exist for survivors accessing their service. And if you’re hellbent on rebuilding them with your own agenda you’re not doing those services any favours. 21 isn’t 40 and it isn’t 37 either, I know that. Hold yersel back, I can count. Let’s account for the 16 who aren’t represented in my list of ‘ayes’ or now wistful memories. Some of them rang out – I’m guessing that’s got something to do with the fact they’re mobbed with the whole, supporting women in crisis surviving domestic abuse on a shoestring budget situation. Some of them weren’t able to get me onto a support worker or someone who could answer questions about inclusivity. All of them I got through to who couldn’t answer asked me to ring back, or gave me a time, number and name of someone to ask for when I get back in touch. Nobody panicked and nobody hung up. (Side note, for sentiment: twice I got cut off and they called me back in seconds). Nobody said “no”. (As an important aside, we want to acknowledge the passing today of landmark domestic abuse legislation in the Scottish Parliament. This was made possible by the tireless work of survivors and staff from throughout the Women’s Aid network. We imagine this type of incredible work might give some sort of idea as to why they’re so busy). Back to the 21 I got to talk to. Key to the door or here, ma heart. As I’ve said, they were able to confirm that trans women can access their service. And, as I said, all of them said more than that. A fair few of them told me about how they’ve got their LGBT Charter Mark and what that meant. Some of them spoke to me about trans survivors they’ve supported in the past and/or about trans survivors they’re supporting the now. One of them reminded me it’s LGBT History Month next month, and they’ve been busy organising stuff for it. I might pride myself on being the queerest queer this side of your gran’s bit, but I’d forgot, and thanks to said frontline worker, it’s now back on my radar and in my diary. There was lots – really, lots – of shared dismay that there’s people suggesting they aren’t doing this work or that they’re doing it with their teeth gritted. I happen to sound even more grating in person than I do on the internet so it’s more than worth saying that a surprising number of workers I spoke to thanked me for phoning and asking them directly. More than one wished me luck. The women I spoke to didn’t sound like women being huckled into political correctness by the government or their national office. I could be wrong but I don’t believe the Sturge was in the background of every call, narrow eyed and thunder faced, shaking a bag of new plastic fivers getting use out of her old ‘YES’ signs. (Words added: Say, Or, I’ll, Shut, You, and Down). These workers were happy to answer and game to tell me more. As a snapshot, in a day (did I mention I did this in a day? ), their willingness to field these questions and then some right off the bat says a lot about claims these services could be bursting at the seams with workers choking to turn trans women away. I hung up the phone and picked up my not briefcase at 5pm with the words: “we wouldn’t turn any woman away” ringing in my ears I’d heard it and its many variations often enough. We had refuge chat (that’s me and all 21 services I spoke to). It mostly went either like this: Can a trans women access refuge? Yes. Sound then. Or something like this: we’ve not supported a trans women in refuge before, but she could and we would look at it and see what was her best option, so it would be safe, and safe for that survivor. The general resounding response was that every refuge space in Scotland is risk assessed and done so together with any survivor looking to access it. That means there’s balanced consideration of the safety and wellbeing of all their service users, every time. Every worker I spoke to confirmed that if a trans woman wasn’t able to access refuge it would not be on the basis that she was trans. As a side note, this is why it sounds so daft when people run with: what if an abusive man pretends to be a woman on the basis of self ID in order to access a woman’s refuge? Firstly, where actually is the man who’s getting up to this because I’ve yet to see him (don’t answer that, it’s not a real question) and secondly, is that no more than a wee bit insulting to practitioners who I think would mibby know their perps from their survivors? Naw? Well failing that, they’ve got robust risk assessments in place anyway, and they use them all the time. Let’s also remember that refuge is a choice, one often not opted for by a lot a women for a lot of different reasons. Some services only have communal refuge and spaces are scarce. So it’s just as well the WA network are next level skilled when it comes to supporting women to navigate the housing system. They support women in refuge, aye, but if you stare at that you miss the masses of work they do beyond it. There needs to be more refuge and they need to be more accessible. Services the now do everything they can with the limited resources they’ve got. That’s practical, not attitudinal – and it’ll look easier the more money they get. If Nicola is anywhere with a bag of plastic fivers, it should be there. Or wherever it is a First Minister goes to pay for hunners more accessible refuge. I like to think she’s as big a fan of ATF as I now am of local Women’s Aid services, so if you’re reading this Nicola, gies that next time. And if cash money is tight feel free to swap it for yer Offensive Behaviour at Parkhead Act. I don’t think it’s an accident that the question of refuge and trans women has and will continue to be fixated on by everyone and their da as we work towards furthering the rights of trans people. It whips people up and who can resist a whip up when trans panic is flavour of the month (year?). What you end up with is a gross misrepresentation of what refuge looks like in practice and a lot of talk that reduces a varied, rich service to rooms and beds. When Shona Craven suggested these services and the women who run them are being near strong armed into inclusion by nobody’s favourite government anymore, she was acting irresponsibly. And when Catriona Stewart dropped that tweet she was too. Misrepresenting frontline services that way is dangerous. It disrupts women’s access to crucial services they need and are entitled to. If it’s out there, unchallenged and unfounded, it could mean the difference between a woman feeling she can go somewhere in crisis or feeling like she can’t. I don’t want to hammer that point but just to be absolutely clear, accessing these services is life saving. We know trans inclusion is tied to funding, anyone with google can work that out in 5 minutes. What these journalists chose to do was highlight that and use it to erase the compassion and values of frontline workers. Tell me again, who’s being silenced and spoken for here? These are people who work with trauma day in, day out. They’re not a national office, and they’re not the Scottish Government; they’re practitioners. These services wouldn’t exist never mind run if they weren’t made up of workers who care A Lot about people who’ve experienced trauma and need support. Don’t use your column inches (or our mentions for that matter) to try write that out of existence. So, services can speak for themselves – if you bother to ask them. I don’t speak for them for sure and none of the individual workers I talked to claimed to be spokespeople. They just answered some standard questions about the reality of their service provision. And nobody, not even this blog, is daft enough to try sell this as a rubber stamp of: transphobia is dead, long live inclusive women’s services. That’s not what I’m saying and that’s not what this is. There’s transphobia everywhere, so if this network of services doesn’t have any it’s the first and only place on earth. But when that fact is clung to like your last snout depends on it and directed at life saving services, it’s worth looking at who’s doing that and why. Because it goes well beyond any journalists mentioned in here. And when solid, consistent work in the right direction is erased, it’s worth making noise about it. I have my guesses about the whys and I’ll keep them to myself so no one tries to sue us again – but there’s no need for guessing about the impact it has: marginalised people get further alienated from services that currently exist for them. For them. For. Them. Mix women’s services with trans rights and all of a sudden you’ve got yourself a half pint of “legitimate concern”. Tan it in wan, because I’m not buying it. There’s a space been clawed out between crucial services and trans women that doesn’t need to be there, isn’t as big as people in it want to tell us, and that’ll take 2 seconds (or a day) to fill in a bit. It’s full to the brim with people often not all that associated with either, shouting “refuge” or “young lesbians” or “children” or “vulnerable, vulnerable women” at each other. And here, if everyone in it donated or signal-boosted their local Women’s Aid every time they shouted it, we could have ourselves more refuge than flegs in Scotland. That’s if you’re bothered about the services, rather than just the scary thing to shout about, mind. If that’s what I could find out in a day, imagine what a senior journalist could do between now and March 1st. I’m glad you looked into this. Something I’d also have asked is whether they’d keep an eye on whether any transphobia was occurring within the refuge. A friend of mine used a refuge last year and was subjected to a great deal of xenophobia and racism from the other woman occupying the refuge. Women’s Aid did not do anything to protect her, and eventually kicked her out because she couldn’t pay her rent (the abuse caused a breakdown and she lost her job) and they expected her abusive husband to be paying it. So I think it’s entirely possible that a trans woman could be admitted to a refuge and then bullied into leaving by the other occupants of the refuge. People using refuges have just gone through trauma, may be mentally ill as a result, and that does not interact well with prejudices, so things can get worse quite fast. Thanks so much for this, it’s vital that a lack of basic legwork is not used as a smokescreen to offload institutionalised transphobia onto hard working, life-saving services.